(MATT) The next day we packed up and went back to Toledo. We caught Mass at the cathedral. We think the Primate of Spain was saying that Mass. There was one gold priest, two white, one purple, and six red priests. It was a beautiful Mass. The cathedral was plain on the outside, but incredible on the inside. It was truly magnificent. I'm sorry that I'm using so many exclamatory words to describe this cathedral, but we were not allowed to film it so I am not allowed to give the reader anymore detail than words like beautiful, incredible, awesome, and awe inspiring. After the cathedral, we saw the Alcazar--the Spanish Military Fortress of old and now both a fortress and a military museum. (SAM) We bought tickets to enter the Alcazar while showing our student I.D. cards and asking for discounts, but no luck as usual. Much of the Alcazar was a military museum, displaying weapons from early Roman swords all the way up to the rifles used in the Spanish Civil War. We also saw garb and weapons particular to the Knights of Malta, Templars, and the Order of the Holy Sepulcher. But, by far the most interesting part of the Alcazar was the history depicting the self sacrificing heroism of Moscardo and the Nationalist defenders of the fortress. We saw the completely non-refurbished room where Moscardo commanded his unyielding heroes. This room, was rattled with bullet holes on the walls adjacent to the single window and on the ceiling. Also in this room one could see two phones along one of the walls that was not as damaged with gunfire. Above one phone encased in glass. was a portrait of Moscardo. Above the other was a portrait of a young man, Moscardo's son. A simple plaque between the two phones records a short yet profound conversation between besieger, the besieged, and a son. Republican Communist: "We have your son and he will be shot if you don't surrender the Alcazar in ten minutes." Moscardo: "I believe you will." Commie: "So that you have no doubt, here is your son." "How are you, my son?" "They say they will kill me if you don't surrender the Alcazar." "Then, my son, turn your thoughts to God, shout Viva La Espana, and die like a hero, for the Alcazar will never fall." "All my love to you, son." In the crypt, we saw where the women and children stayed during the bombardment. There were foot-long, half exploded shell casings displayed on every ledge. A large model of the Alcazar depicted the fortress after the bombardment when Franco came to its rescue. The bombardment must have been almost unbearable because 2/3 of the Alcazar was rubble. In the crypt, we also saw a chapel. The commies sent a priest to persuade Moscardo to surrender much like the Covadonga situation. But in this case, the Nationalists told the priest to cut his chatter and get inside to say Mass for them because they had not had the sacraments for months. We could not find the plaque that said, "Here is where Our Lord visited our heroes." All very impressive. It all made us want to die in battle for a worthy cause. After a photo outside the Alcazar, we walked to a store where I saw swords made of the famous Toledo steel. I put two swords on the plastic ($120) and Chris bought a Real Madrid jersey, the local soccer team. This article of clothing would be a source of some controversy later on. Off to Madrid!!! P.S. I was very impressed with our second impression of the great city of Toledo. (CHRIS) So we hit 401 North and it only took about an hour to get to Madrid. As we approached the city, we had many desires and hopes, but we had to get our priorities in order because everything touristy closes on Mondays, so we had only this afternoon. Here were our needs and desires: 1) Eat and drink (it was hot.) 2) See El Escorial and the Valley of the Fallen 3) See a bullfight. 4) Get gas. So how would we order all these desires. I demanded that the bull fight be our #1 priority, and my motion carried the day. All we knew is that bullfights were usually on Sundays, but we didn't know what time. And our maps showed no bull rings. 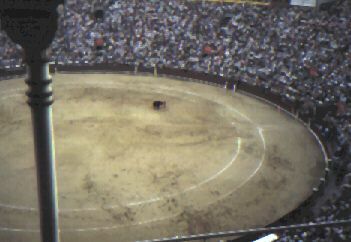 One guidebook said that the largest ring in Spain was on Madrid's east side. 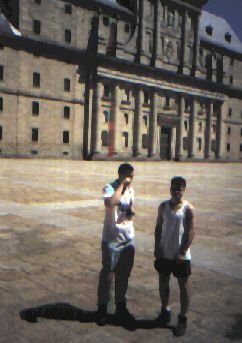 So we headed east and there was Placia de Ventas. The guards told us there was a fight at 7 p.m., but it was sold out. But then he added with a gesture to go up to the stadium and look. As soon as we got out of the car, the scalpers were upon us. The first guy offered Sam and I tickets for 7000 pesatas each. They were good seats, but we had only 7000 pesatas TOTAL. We moved on. The next guy offered us quatro tickets for 16000 pesatas. We gave him $140 American and he was happy. I think we paid nearly 2 times the original price, but oh well! The building was huge, but did not seem crowded. It took us awhile to find the front door, but when we did, they told us we were closed 'til Tuesday. Bummer. So we headed for the near-by Valley of the Fallen, which had a 500 foot cross and a grave yard to commemorate the Civil War (1930's). Again, we found it closed. Then we saw why everything was closed; today is election day! So we headed back to the bull-ring. It was past 5:30 and the roads and parking lots around Ventas were starting to clog. We got in O.K. and paid a old guy $1.80 to watch our car. We bought some water; Jon got a Cuban cigar (about $10) and we snuck in the camcorder. Or seats were at the top, which was the only shaded section. The stadium held 25,000 (1/3 of Rich Stadium), so we could see fine. We got to communicating (not really talking) with an old fan of the sport and we learned a few things. The seats were basically concrete slabs, so your feet were on the seat of the guy in front of you. At first, this seemed awkward and uncomfortable as the stands began to fill up. Then, these two bonita senoritas came over and sat behind Sam. (Sam always gets the end seat!) So Sam had a silky smooth back rest for the entire fight. Though they were separated by language and culture, when her eyes met his, there was thunder and lightning, fireworks, if you will. These girls began teaching us about bull fights... and other things. Ah, Espania! MEANWHILE, in the ring below, the bloodshed had begun. Out charged the majestic black toro. The matador juniors teased him with pink capes then darted behind the protective walls. Then came the cavalry. Two riders on horses with soft armor trotted out, flanked by the pinkies. Each rider had a spear, but surprisingly, the toro drew first blood on the horse as he broadsided him. Soon the rider was poking toro and then the pinkies drew the bull away. For the next round, men with two colored spiked sticks ran out. They were supposed to score both sticks in the bull's neck. If they missed either, the crowd whistled in disgust. Whenever things got slow, the crowd clapped in a pattern to show their disappointment. Finally, out came the real matador to face a tired, bleeding foe. All the stereotypes were there--tight pink pants with gold decor, the black mickey mouse type hat, the red cape, the whole nine yards. Whenever the matador fooled the bull several times in quick succession, the crowd yelled "Ole!" on each pivot. Most of the fans seemed more like critics than fans. They became bitter if there was a weak bull OR a weak matador. Anyway, this whole procedure was repeated six times. Each one ended with the final sword thrust. Then the bull staggered, coughed up blood, and keeled over. Then three horses dragged him to the slaughter house. The fans never really got too excited--just polite clapping. One bull took three or four "final" thrusts before falling; he had brass. The last matador's sword would not stay in; he rotted. All together, it was an incredible experience. We were all glad we spent the $ and went. Afterwards, there was music in the square outside and many salespeople hawking cigars and nuts. "Ole!" Sam and I called Tobias, Sam's pal from Louisville who lives now in Valencia, but he was out of town for the week. 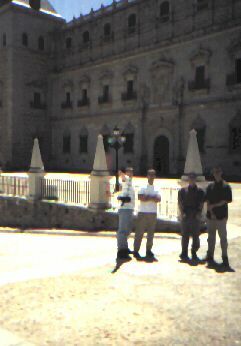 Afterwards, we began the drive to Zaragoza. We stopped for a full dinner at a restaurants near the road. Soup, salad, pork chops, and dessert and wine for about $50 for all four of us. Bueno! We drove about another hour, found a side road with a grassy patch near a farm, and set up camp. The stars were awesome; the temperature was perfect. We drifted off to sleep about 1 a.m.